Discussion in 'TV, Music and Movies' started by Bruzer, Nov 28, 2014. This exactly. The whole Snoke thing just felt kind of like a red herring in TFA. Like, back in Ep IV we had no idea there was an emperor until like halfway through the first movie, we didn't see him until the second IIRC, we never found out (until the prequels) exactly who he was and how he came to be. ****, we didn't really even learn who Vader was until Empire and the big reveal. You could tell things were getting a bit weird at that point too, like the plan didn't QUITE come together. Think Luke and Leia kissing in front of Han. Gross. Obi Wan and his "certain point of view". I guess if people expected more fan service instead of what we got that may have been frustrating or confusing at first, but I definitely enjoyed it, and seeing it again multiple times with that knowledge has, for me, just increased my enjoyment. I really hope JJ doesn't do anything dumb like "Lol Rey, you actually ARE Luke's kid, Kylo lied har har har." That is why I laugh when people say that the orig trig was a plan. It wasn't a huge plan. They winged it. They just made an amazing second movie. Edit: The problem with Snoke was he was a mystery to the audience, however, to all of the characters in the story, he was known. No one wondered where he came from, who exactly he was, or anything. To have a big reveal about who Snoke is, would be stupid because everyone who would be there for this reveal would be like, "I know. Duh"
OR they would have to create a part of the movie just for him and his reveal, which would have added nothing to the narrative. Personally, I'm very much hoping that Kylo either lied or was just wrong, and Ray does have some connection to another known character. The only thing I can think of is if she is a secret child of Mara Jade. How do you not ruin those connected people? I think that its going to be huge. All signs point to this being the end of the story for most of the characters involved. I showed the poster to my 7 year old daughter and it blew her mind. She yelled: whoa the Knights of Ren! 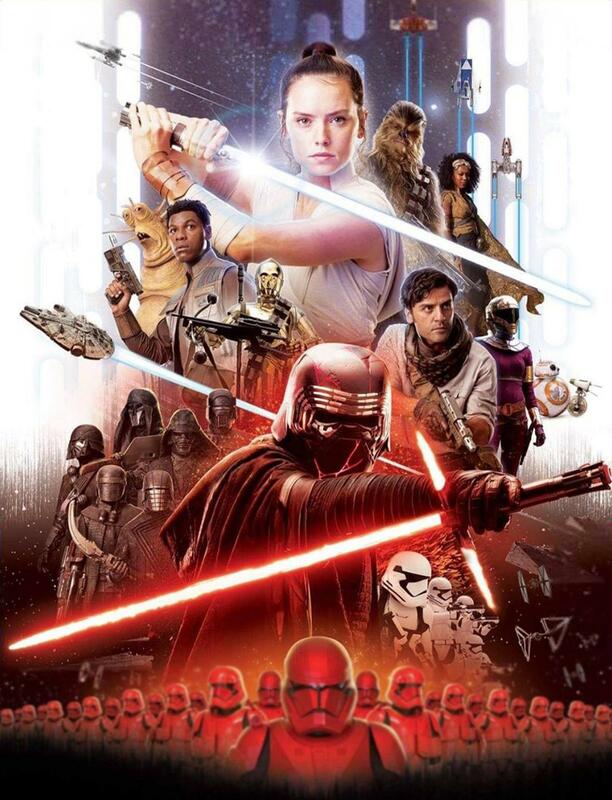 I wonder why C3PO is holding Chewie's bowcaster and I wonder why is there a mighty morphing power ranger look alike in there? He also has Rey’s staff. Also, Disney CEO Bob Iger says that this will be the last Star Wars movie for a while. How long that will be is unknown, although there are several in development, so likely only a couple of years. #1 fan, danmarino and Fin D like this. Also, the wonderful Alan Tudyk will reprise his role as K-2SO in a Rogue One prequel series on Disney+. Between the Star Wars and Marvel stuff, there's going to be a lot to watch. Ohio Fanatic, danmarino and Fin D like this. The name of the film is interesting, and about the one thing that gives me pause - I really hope they don't retcon the whole thing to be "Lol yeah Rey is totally Luke's kid" or whatever. Heard some theories of "Skywalker" being titular, or basically the new "Jedi" which I find interesting considering the last film was The Last Jedi - Luke's passing ending the Jedi but beginning the Skywalkers, fitting. The music of Star Wars man, that just puts one in the mood immediately, love it. Lando laughing at the helm of Falcon, yes please. Death Star debris, sign me up. The Emperor? WTF!?!?! I'm in. Rey and Kylo doing some weird fight/training on a desert planet? Yas! Give it to me! My quick theory - somehow the Emperor survived RotJ, was responsible for the rise of the first order, Snoke and Kylo's betrayal. Rey stumbles upon/realizes this, presents to Ben who switches sides to put an end to Palpatine for good, forming the Skywalkers with Rey (with one of them dying). I could of course be entirely wrong, perhaps the Palpatine laugh was for dramatic effect more than an inkling of a role for him, but it still sounds good in my head for now. Ohio Fanatic, The Rev and Unlucky 13 like this. For real though, everything points heavily to them in a relationship. Even after the ending of TLJ where Kylo takes on Luke and tries to destroy the rebels. It's just the Star Wars thing to do, and I won't be disappointed if they do go that route. Then again, maybe they do defy expectations and he really is the big bad. I hope they undo everything from Last Jedi. Rian Johnson just straight up pisses me off. I am all for people putting their own spin on a story, but he had utter contempt for entire story leading up to Last Jedi so he did everything he could to minimize everything 7 movies were building towards. The real heinous part is that the studio let him have his own trilogy, so that is where he should tell the non-skywalker story he wanted to tell. Arrogant piece of crap hack, up there with Zach Synder. Well, given that Johnson has said that he's ok with his movie being retconned by this one, I'd say they're likely going to fix a few things. I have a lot more faith in Abrams. Hopefully, the series ends with most people happy with how it turned out. Also, Abrams met with Lucas before working on Ep 9 and the two of them talked out how to finish the series. Hopefully, cooler and smarter heads prevailed, and everyone puts their own egos and agendas away to make what people will enjoy. Like I generally don't care if you change things that aren't integral to the essence of the story, like race or gender or changing time periods, etc. But the current Star Wars stuff is the story of the Skywalkers. If you don't like the Skywalker story, don't contribute to it. It is like Snyder with Batman. Batman doesn't kill. You don't get to change that just because you want grittier material. Go make a Punisher movie, or you know.....The Watchmen! !